Are you or your child interested in learning to play drums? Private lessons are the best and quickest way to drum proficiency, and I’m here to guide you! 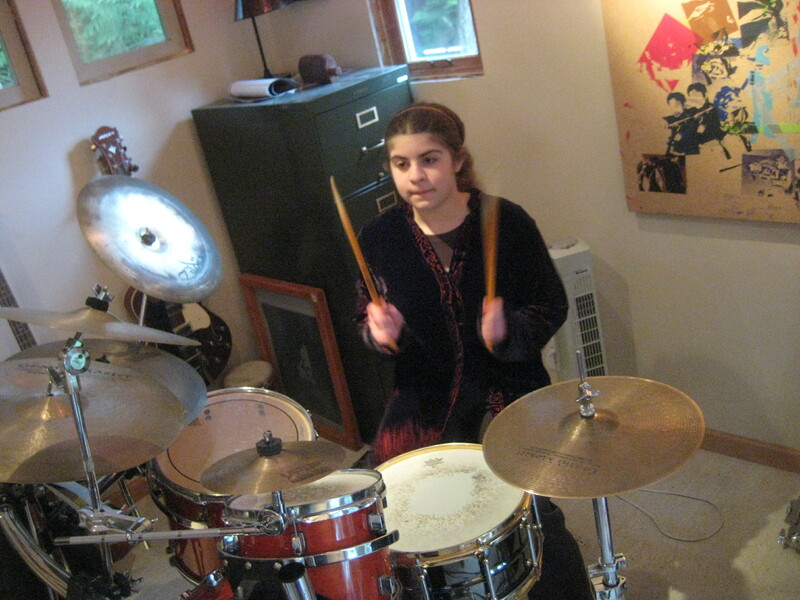 I have been teaching drum lessons on Bainbridge Island since 1997 and have worked with about 150 of Kitsap County’s brightest budding rock stars. My teaching philosophy is simple: Music should be fun and my job is to foster a life-long deeper appreciation for the art form. Along the way we’ll learn to read music, develop technique, be exposed to a variety of musical styles, and have the opportunity to play for an audience on a real stage, backed by a professional band. But no matter what, it should always be fun. Lessons generally start on a pad or snare drum. The move to drum set depends on a few variables including the student’s age, progress, and commitment level. If you have a drum set already, great! We can get started on drum set work sooner. Not ready to take that step for space or financial reasons or because you’re just not sure you or your kid is going to stick with it? No problem, there’s plenty to work on without the full set, trust me. In my opinion, drum set is a uniquely social instrument. They were designed with the intent to back up other musicians. I know there are many drummers who will argue this with me. Seriously though, who in their right mind, aside from another drummer, is going to want to listen to an evening of drum solos? Drums are meant to be part of a bigger team. You can’t just have a quarterback or pitcher on a sports team, can you? Drums do more than “just keep time” as we drummers often hear. We also embellish and create texture, change the mood, create excitement and anticipation, and set the feel. And yeah, we keep time. We can also change time better than anyone else in the band. We’re really the band leaders – just don’t tell the band leader! Throughout the year students are invited to bring friends and bandmates to their lessons. I love having the opportunity to teach them in a band setting. I often have students show up after a game or sleepover with a friend who has no music experience at all. I relish the chance to hand them an electric bass, strap my guitar on myself and put together an instant band! Every spring, all of my students participate in a drum recital for friends and family. We tried the stuffy recital format for a year or two and then I realized I was missing the point. I renamed it “Conundrum,” put it on a stage, added lighting and put together a rock band made up of friends and students and now we annually have one of the most fun, eclectic and inspiring nights of music you’ll ever attend. Read on for more information and answers to your burning questions. Then, call or email me and let’s get started! $120 per month based on four 30-minute lessons per month. In the event that there are five lesson days in a month, we will take one week off by my choice. I always do my best to choose a week that coincides with a holiday or break. Your tuition is a payment for holding a weekly spot for you or your kid. For that reason, please do not schedule medical/dental appointments, play dates, etc. for the same time as your lesson. I’m counting on your attendance for my own bills and you’re counting on your attendance in order to progress at a steady rate. If you do need to cancel, I will do my best to reschedule your lesson but cannot guarantee a make-up. I have a family, a full-time job, and a band that plays about 120 shows per year so I try to keep teaching to just two days per week. In the event that I cannot schedule a make-up, your tuition for that lesson will be forfeited. With advance notice, I can usually make-up one missed lesson each month if need be. Although I understand it can be painful to pay for a month of lessons that you can’t attend because of an extended vacation, please respect that I cannot fill that time if you plan to continue in that time slot and I count on that tuition to pay my bills. Again, your payment is effectively holding that spot with me every week, therefore please bring or mail a check the first week of the month. Think of it like daycare, a doctor’s visit, Little League & Hockey signups, Girl Scouts, private school tuition… you pay whether or not you show up for your time. Occasionally my job, family or band require me to have to reschedule. When that happens I will 1) offer an alternate day for the lesson (usually the same time, next or prior day). If that doesn’t work out I will 2) credit you one lesson the following month. The Golden Rule of practicing: The more you practice, the quicker you’ll improve. The best way to improve at anything in life is with practice. It doesn’t have to be a ton, but with drumming, which relies heavily on muscle memory, repetition is key. In my experience, it is better to practice a little bit every day than to cram it all in the day before a lesson. Your body needs to play the rhythms repeatedly, your ears need to hear it correctly, your eyes need to recognize the rhythms. When we meet for a lesson we cover many things, not all of which get written down and if you wait a week to practice, it’ll all be lost.